Tucked in an alleyway named Waverly Place will soon be San Francisco Chinatown’s newest restaurant, Mister Jiu’s. Months before opening, it had already garnered mentions in a New York Times article about a new generation of Chinese American chefs, and on food blogs everywhere. Brandon Jew (formerly of Bar Agricole) is the chef behind the organic Chinese fine dining restaurant in the former Four Seas Restaurant, which anchored that space for 50 years. When I arrived in mid-February to interview Jew, the first floor of the restaurant was under full construction. Jew and his wife were tiling a wall in one corner of the kitchen. 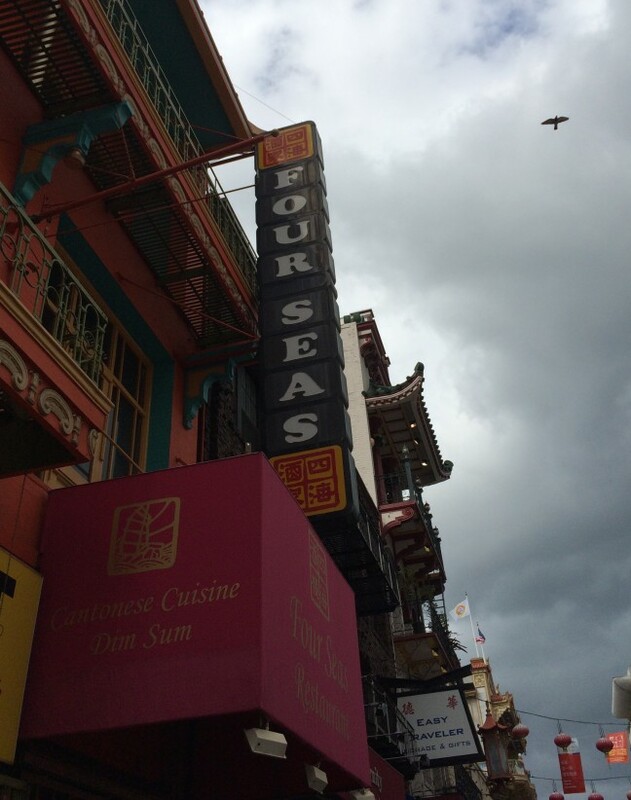 The original entrance to the Four Seas is on Grant Avenue, the tourist hub of Chinatown. Jew chose the smaller street as the entrance to give people a different experience of Chinatown—one that’s more quiet, more lived-in, and less touristy. The locally grown, born and raised San Franciscan’s family goes back three generations in the U.S., starting in the 1920s. His menu will include traditional and California-influenced Chinese dishes, and even reinterpretations of Chinese American dishes like chop suey and egg foo young. 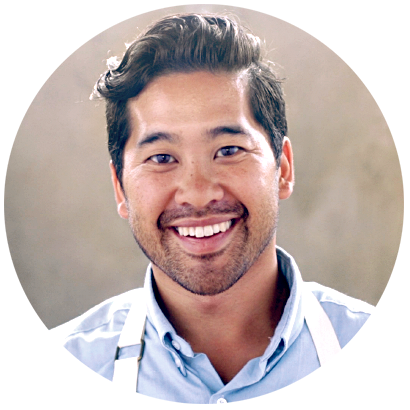 He plans on having an organic and locally sourced pantry in the kitchen, from the soy sauce to fermented chili paste. The downstairs is set to open in March, and one day, he would like to open the upstairs as a bar and private dining area, where people used to hold their wedding banquets and red egg parties. In fact, he hopes to continue these traditions. (His own uncle was married there). Jew sat down with me in the upstairs banquet hall to talk about how his grandfather immigrated as a “paper son,” about Chinese food, and about his inspirations and creative process. Brandon Jew will be honored at CAAMFeast 2016, alongside Cecilia Chiang and George Chen. 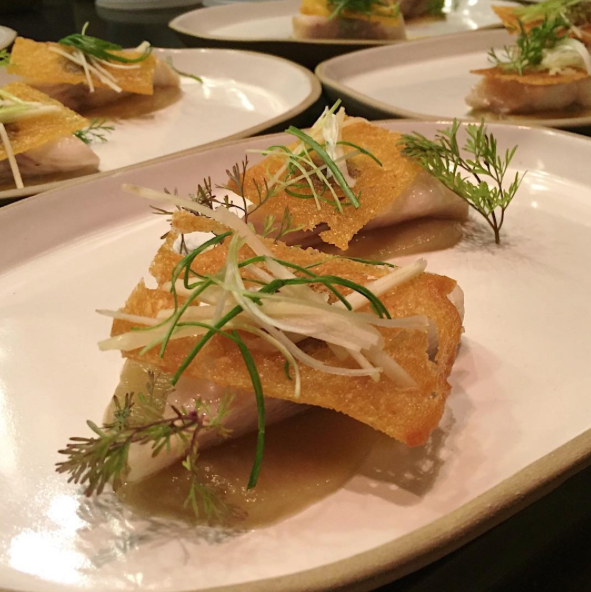 His dish, “Shrimp chips with Dungeness crab, kohlrabi, apple and prawn roe,” is on the tasting menu for the evening. For more information about CAAMFeast and tickets, go here. The community used this space as a celebratory space. It made it very exciting to me for the opportunity to be here. I’ve always viewed restaurant as a place for people to celebrate and gather. In Chinese culture, everything happens around the dinner table. To me, more and more, I feel like because of how much technology is out there, it’s very important to have a place where people can interact face to face. What I’ve always loved about Chinese food too is it’s very communal. You share your food, you pass food to each other, you even put food on each other’s plates sometimes. I think having that kind of interaction is going to be more and more important to our society, because there’s less and less of those interactions happening now. To me, this restaurant is hopefully going to be a symbol of hope and the next generation of this neighborhood. I think for a long time, a lot of other Chinatowns, like L.A. or even Vancouver, they’re kind of becoming ghost towns. The Chinese community doesn’t really live there anymore. That’s something I thought was special about this neighborhood. It’s continued to be a place for immigrants to reside in. This restaurant is a place to celebrate the history and the vibrancy of this neighborhood. I used to follow her as she went to all the different stores to get things for dinner. I always remember that experience going through Chinatown. It’s hard to get what you want in Chinatown because you have to kind of fight for it. There are so many people wanting their groceries for the night. I think having that experience really resonated with me as a chef—how much attention goes into picking ingredients. Those are my most vivid memories of Chinatown. I have that in me from her: the amount of curation into every ingredient. The things that were nostalgic to my childhood, and my parents telling me what they loved—that’s where I’m drawing a lot of my inspiration. I also feel like there’s a lot inspiration to draw from this neighborhood. In its heyday, it was known for chop suey and egg foo young, these dishes created for the American palate. I like food history, I like food that has a story of why things were done that way. I feel like that’s a big part of my job, to have traditions be carried out through food. Even our local food here, like artichokes and crab, all these Californian things. I’m also very excited to use those in a Chinese context as well. I feel like that will better help define what is San Francisco Chinese food. In general, concentrating on our ingredients is what’s going to distinguish our food. We’re on a journey, too. Our food is going to evolve. I start with an ingredient that I think is great, and start with seasonal things that can compliment it. Then think about what technique to use to best showcase the ingredient. Cantonese cuisine and California cuisine really align in how ingredient-driven the food is and how minimal—the goal is to do as little to a perfect ingredient. Finding that perfect ingredient and thinking of the cooking method to showcase its natural flavors the most, to me, is very Cantonese and Californian. I’m using that mentality to bridge the two together. So my creative process usually starts with an idea that’s either based on recreating a historic dish or showcasing an ingredient. Then it’s just testing it until I’m happy with it, until my sous chefs are happy with it, and then we figure out how to make 40 or 50 of them a night. It really starts with the ingredient for me. There are just some classic things we want to reinterpret. There isn’t a lot of specific recipes for a lot of things. Chop suey just doesn’t have really any recipe to it. We’re taking the creative freedom to do our version of that, or even something like egg foo young. Sizzling black cod – sourdough, scallions, young ginger. Via @misterjius Instagram. We’re looking at doing red egg parties. To have a space that we can host parents to have a red egg party for their kid, those are the kinds of celebrations I want to continue for our culture. If we are able to do a wedding here, that would be cool, too. In general, I think we’re looking to just have a place that people can celebrate in. And we hope that people will come here to celebrate the food and this neighborhood, and the history of this neighborhood, and the future of this neighborhood too. So my last name is spelled J-E-W. That’s how the immigration officer—or I don’t know who—when my grandparents came to America, they spelled it J-E-W. I felt like, you know, in pinyin, there’s not J-E-W. I was thinking about the story of just how it’s a lost in translation thing. My last name was changed because of that, and regaining our last name to what it maybe should’ve been written as, was why I named the restaurant J-I-U. My dad’s side is from Toisan. My mom is Long Du. It’s further north than Toisan. It’s a very small village. They came to the U.S. around the 20s. It was during the Chinese Exclusion Act. My grandpa came over then. Even our last name—which kind of more confusing—[may not be our real last name]. My grandfather used faked papers to get in. You couldn’t come in as a Chinese unless you had a relative that was already living there. He basically had bought papers. I was a bio major in college. A lot of the systems that I support are because I’m very interested in life systems and Earth. And processes that improve the soil, that improve the air quality. All of these kinds of these are important to me. So, I try to do my part in what I purchase and the people we buy our stuff from, all those kinds of things. To me, what it comes down to is, it tastes better too. There’s a lot of skill in Chinese food, and there’s a lot of history. I mean, why is French food so expensive, why can’t Chinese food be considered in that same vein? Why won’t people pay for good quality Chinese food? That’s a question that I’m going to find out. We’re going to use great ingredients, and it’s going to be more expensive than your average Chinese restaurant. What I remember from eating my grandma’s food is after eating, you feel good. That sensation is what I want people to experience. Understanding that chefs back in old China—they were considered doctors too, where they were healing people and giving remedies to fix your ailments. A lot of it was basically what they were feeding you. I try not to take it too seriously, but there are things I feel like as a chef, I feel like it’s my responsibility to make people feel good afterwards too. Directions in Sound Goes Off Tonight!